Traditional wheat products such as pastas, breads, crackers, and other baked goods are not gluten-free. However, there are many gluten-free options available that use alternative flours and grains. Here at Caraluzzi's we don't believe gluten-free groceries should be hard to find, so we've made sure to stock our shelves with only the finest quality gluten-free products. Below are some gluten-free recipes that are sure to be a hit this holiday season! CHEESE & CRACKERS: For an easy yet delicious appetizer, serve gluten-free crackers with manchego cheese and a bit of fig spread or with Brie and a drizzle of lavender honey. Try Simple Mills Gluten-Free Crackers, a crispy and delicious cracker made from all natural wholesome ingredients. MEATBALLS: Served as an appetizer or part of a meal, meatballs are a versatile food that can be prepared a variety of ways. For authentic Italian-style gluten-free meatballs, try using Aleia’s Gluten-Free Italian Bread Crumbs combined with our fresh ground beef and pork or veal. TURKEY GRAVY: Make your turkey dinner gluten-free with Simply Organic Roasted Turkey Gravy Mix. For instant, foolproof turkey gravy, Simply Organic Roasted Turkey Gravy is as close to homemade as it gets. Delectable seasonings such as onion, black pepper and sage partner with organic chicken stock to enhance your meat, potatoes or biscuits. SAVORY STUFFING: Every bite of Aleia's Gluten-free Savory Stuffing is perfectly seasoned with a balanced blend of herbs and spices. Flavorful, aromatic and ridiculously delicious, you will want to serve it as a side dish year-round. DINNER ROLLS: If you are looking for a delicious gluten-free dinner roll then look no further. BFree Soft White Rolls are gluten-free and made with a delicious blend of flours, starches, fibers and proteins and contain less than 1g of fat per roll. Find them in our freezer section. CARALUZZI'S ALL NATURAL FRESH TURKEY: Our best selling fresh turkey makes for the perfect holiday dinner and is naturally gluten free. A broad breasted bird that is moist and tender. You can even order our turkey fully cooked by our store chefs, ready to pick up for Thanksgiving morning. CARALUZZI'S PREMIUM SPIRAL HAM: Our spiral carved hams will truly make your meal memorable. These natural juice, bone in hams are carved to perfection and have a mouth-watering flavor. We’ve also added a honey glaze packet as the perfect accompaniment. These moist and tender hams are also MSG and Gluten Free. LASAGNA: Always a hit, lasagna can be gluten-free and still taste delicious. Try DePuma’s Gluten-Free Lasagna Sheets in our frozen foods section. These no boil lasagna sheets help the at home chef create the perfect lasagna. Your guests wont even be able to tell they are gluten free! Pair with our Caraluzzi’s Marinara Sauce for a delicious holiday lasagna. 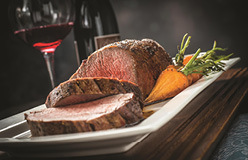 FILET MIGNON ROAST DINNER: Tender and delicious, a filet mignon roast paired with mashed potatoes and gravy is a holiday dinner favorite. For a gluten-free meal make the gravy gluten-free by using Simply Organic Brown Gravy Mix. It’s super easy to make, and it’s organic and Gluten-Free! TIRAMISU: The quintessential Italian dessert: tempting crème of delicate Schär Ladyfingers, mascarpone, coffee and cocoa. And yes, it’s Gluten-Free thanks to Schär’s Gluten-Free Ladyfingers. A wonderful Italian delicacy to add to holiday festivities. PUMPKIN PIE: Making pumpkin pie gluten-free is all about the crust, try using Mi-Del Gluten-Free Gingersnaps to make your own pie crust or use Wholly Wholesome pie crust for a super easy pie! This pumpkin pie will taste just as good as the classic. CHEESECAKE: Whether baking your own or looking for a pre-made cheesecake, going gluten-free won’t be difficult with this dessert. If making your own try using Mi-Del’s Graham Style Pie Crust. Mi-Del Pie Crusts are ready to use and there is no baking required. For a pre-made cheesecake try Daiya’s New York Cheesecake for a classic, rich, velvety taste - no baking required!